This morning we were playing a game of Elefun, the game where fabric butterflies are blown from an elephant’s trunk for the children to catch in nets. I know, let’s go and catch butterflies outside. 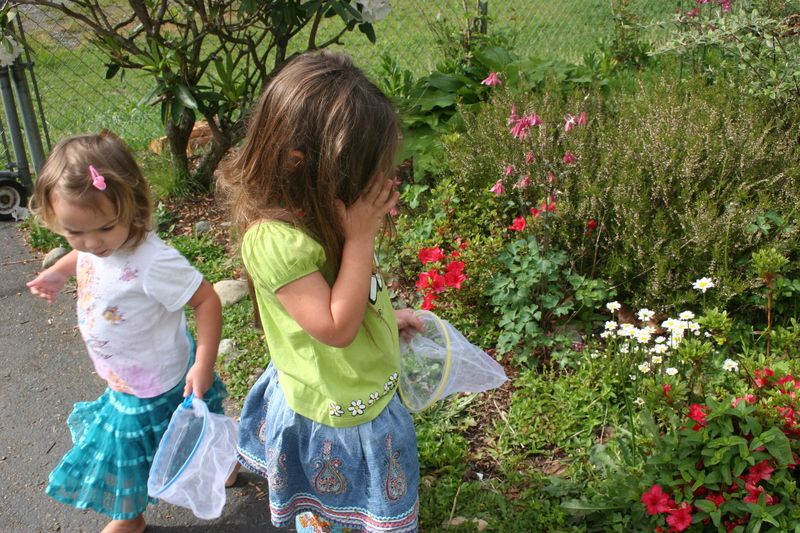 My 4-year -old quickly ran outside to look around the garden for butterflies. I explained that we needed to be quiet and still if we were to find any butterflies. Butterflies are attracted to red, yellow, pink and purple so we looked for flowers in these colours and waited. I might find a butterfly, they like red and yellow so they might land in my net. If we are very quiet we might catch a butterfly. The hunt for butterflies was not very successful so they started to look for other creatures instead. I’m trying to catch butterflies. what else can I find to put in my net? These leaves are really soft. We’re not allowed to pick them but we are allowed to stroke them. They found a woodlouse (or roly-poly as the kids here call them) and lots of bees but no butterflies. I know let’s make some butterflies out of paper. I cut out some paper butterflies. The girls wanted to decorate them with stickers but I could only find white ones. I know let’s draw patterns on the white ones. Now you hide them and we can find them and catch them in our nets. The finished butterfly, without instruction my daughter decorated it with Symmetrical wings. ‘Butterflies never have 2 wings that are different’. I hid them in the bushes. Found one! Now I have 1,2,3.4 butterflies, only 4 left to find. What lovely activities to inspire creative fun! Shame they didn’t find any butterflies, thanks for liking up your sunny pictures to Country Kids. We have elefun, it lasts about 5mins then they’ve had enough. Going outside to catch the real thing sounds much better! 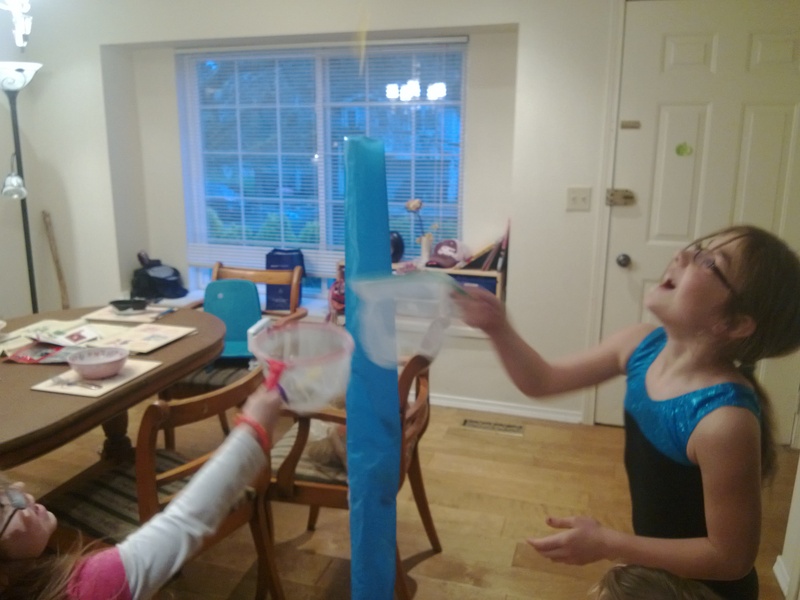 Wow what a great way to turn a game into a lot of fun and different activities! I’m very impressed! We have had some fun chasing butterflies while we were on holiday in Italy! Lovely idea – simple but lots of fun. Must try this later on in the week! That is such a great idea to entertain the kids, congratulations you’re very good at it. I will try doing that game with my kids one of these days, I’m sure they’ll have lots of fun playing it. Thank you for the idea. Adorable! 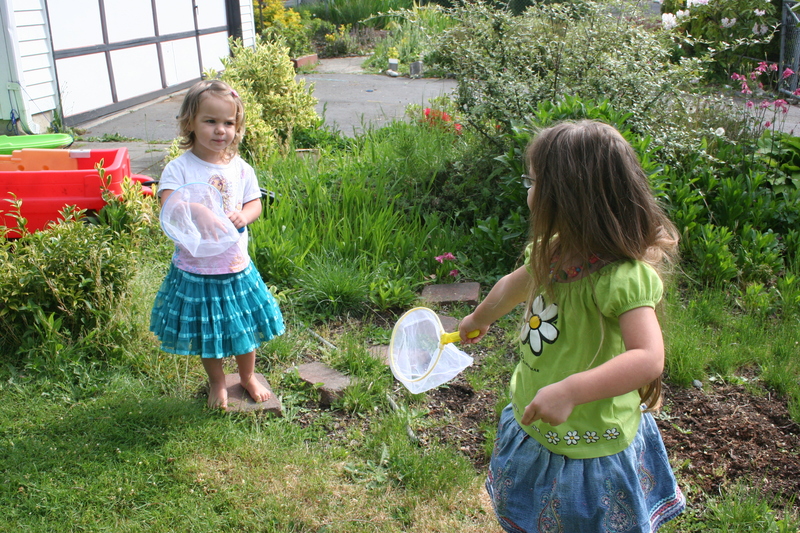 Love the idea of making your own butterflies to “catch”, much more satisfying that way! Thanks so much for linking up to the Outdoor Play Party.